As our Royal Jordanian plane touched the runway, all passengers were glued to the windows. Amman International Airport looked like any other airport except the workers, while dressed in standard overalls, also wore the traditional Arabic headdress — the kaffiyeh. Next to our plane was the area of international arrivals and we could see two uniformed men frisking passengers that arrived just before us. "Did you see that?" asked Alexandr Ivanovich, the official leader of our Soviet tourist group. A man in his 40s, he wore suit and tie, strictly complying with the dress code of Soviet officials travelling abroad. Typically, a leader of a Soviet tourist group would be a graduate of the Moscow Institute of Foreign Relations recruited by the KGB to supervise Soviet tourists visiting capitalist countries. "You can see," he said, "that they don’t trust foreigners here, especially those who come from the Warsaw Pact countries." As I stepped out of the airplane to descend the stairs to the tarmac, I was hit by heat and humidity unlike any I’d ever experienced — much worse than any summer day back in Kazan, where I had been accustomed to a moderate climate. I was born in Kazan in 1960. The capital of the Tatar autonomous republic, it was then a part of the Union of Socialist Republics. After finishing high school I worked as a commercial artist in a helicopter manufacturing plant while studying history in Kazan University. In 1980 I decided to escape from the U.S.S.R. Two years passed before I managed to obtain the documents that permitted me to go to Syria and Jordan, in September 1985, with other Soviet tourists. Now that I was here in Amman, I was planning to escape. Once through customs, we boarded a bus to go to the hotel where we would spend the first two days of our five-day stay. We gathered in Alexandr Ivanovich’s room as he gave us instructions. "Try to avoid any contact with the local population. There were some provocations on the part of the local intelligence services against Soviet tourists and diplomats in the past. So be vigilant. If something happens to you, if you are arrested or stopped by the police, refuse to talk and immediately demand a meeting with a Soviet embassy official." He gave us the phone number of the Soviet embassy. "Remember, Jordan is a poor, developing country but still a capitalist country!" "It doesn’t seem to be too poor to me," someone interjected timidly. "Each street is filled with expensive shiny cars." "You don’t understand," said Alexandr angrily. "We drove along only the most wealthy parts of Amman. The rest of the city is much poorer and in the countryside people even starve to death. Make sure to spend all the foreign currency as soon as possible, because in two days we’ll leave Amman and go to other parts of Jordan, where you won’t be able to shop." I fumbled inside my pockets. I had only sixteen U.S. dollars, the equivalent of 40 Jordanian dinars. Ordinary Soviet tourists were allowed to take only very small amounts of cash abroad. Most members of our group were obsessed by shopping, but I wanted to make sure I had enough money left for a taxi ride to the American embassy. Alexandr Ivanovich took our passports and IDs from us for the duration of the trip and promised that we’d be given temporary traveller’s IDs. He then told us our visit to the National Museum had been cancelled due to Prime Minister Margaret Thatcher’s visit. "Don’t worry," he said, "there are many other interesting sites that we are going to see - for example, the city of Petra that is hewn out of a solid piece of rock. In a port city of Akaba we’ll take a trip on a boat with a glass bottom." Alexandr then paired us up for room assignments. To my surprise, he chose me as his roommate. As I was watching an English-language program on TV that evening in our room, he looked at me suspiciously and asked, "Do you understand anything they say?" "No. Just a tiny bit," I replied honestly. The program was "Remington Steele." The next morning, Alexandr formed us into groups of four or five and suggested that we go shopping. My group, mostly men in their 40s, decided to find a bank where we could exchange our dollars for Jordanian dinars. After walking a few blocks we found a small bank that offered foreign currency exchange, with only one clerk at the counter. I was the only one of our group who spoke some English, so I finished before the others and went outside. Suddenly, it dawned on me that I was alone. I felt my blood rush. This was the perfect opportunity to escape. For a second, I was overwhelmed by both the solemnity and the excitement of the moment. I could almost see a line drawn in the air, separating my past from my future. "This is it!" I told myself. "This is the moment!" My first impulse was to run, to disappear into the crowd around me. But I had to be careful. Someone might be watching, so I pretended to be window-shopping, moving slowly, farther and farther from the bank. Several more minutes, and I reached a taxi stand where I approached one of the drivers. "Could you, please, take me to the American embassy?" The old man didn’t speak or understand English. Then I tried the Arabic phrase I had learned for just such an occasion. "As safra Amerikania!" I shouted. The driver nodded in a friendly way. He opened the door and I jumped in. As the cab pulled from the curb I fell into the seat and sighed deeply. I had done it! I was puzzled when the cab stopped in front of a modest two-story building. I had expected the embassy to be big and imposing. Except for cars passing in the street, there was no activity around the building. I got out of the cab and looked around me to make sure I hadn’t been followed. As I approached the entrance, a fat black man wearing a uniform and a baseball cap stopped me. "Excuse me," I began saying, but he interrupted me as he nimbly frisked me with a portable metal detector and then motioned me toward the entrance. I walked through the door, and into the lobby of the American embassy. Several people, presumably Jordanians, stood in line at the counter. I overheard talk about travel documents, so I got into line and nervously awaited my turn. Suddenly an announcement seemed to blast from the public address system. "All the visitors are kindly asked to vacate the premises temporarily to allow the cleaning personnel to clean the floor." What? To go back out, to leave the safety of the building and wait outside, in full view of passing cars? There was no choice. The line scattered and we all walked out of the building. As I stood outside with the others, it occurred to me that I was the only person not talking to someone. Most were here with family and friends. I was alone. If a KGB car passed, I would stand out in this crowd. Next to me was a woman with two little kids. I put my sunglasses on, turned towards her and asked, "How long will they keep us waiting?" "Usually, it takes only five minutes," she smiled. A moment passed. "Is this the first time that you travel to the U.S.?" "Yes," I confessed, "the first time." Indeed, only a few minutes had passed when the same guard again searched us with his metal dectector. This time, as we entered the building, I happened to be at the head of the line. My heart was racing as I approached the counter. "Hello." I hardly recognized my own voice as I addressed the clerk behind the thick bullet-proof glass. My name is Sabirjan Badretdinov. I came to Jordan with a Soviet tourist group and I want political asylum in the U.S." The man looked at me as if I just told him a joke he didn’t understand. "Could you, please, repeat what you said?" he asked. I took a deep breath and again stated the phrase that I had rehearsed so many times in Kazan. Shock and amazement was suddenly written all over his face. "Please wait here just a second," he rattled off and disappeared through a door down the hallway. Minutes later a woman, dressed neatly in business suit, opened the door and approached me. "How can I help you, Sir?" she asked politely. I again carefully stated my request for political asylum. "Follow me please!" she said, and I followed her through the door that opened into the inner rooms of the embassy. Our footsteps echoed down a long corridor, then we turned left and entered a small room with shelves lining the wall, loaded with thick folders. "Please take a seat. Someone will be with you in a moment." She smiled at me, then turned and left the room. Filled with apprehension, I lowered myself into a chair near a big wooden table. A small sign on the table read, "Gordon G. Olson, Deputy Consul." Minutes later a blond man inhis late 30s came in. He greeted me and sat at the other side of the table. "So you are the Russian defector?" he asked me, somewhat jokingly. "Well, actually, I am a Tatar." "What’s a Tatar?" he asked. "It’s an ethnic minority in Russia," I explained to him patiently. "My knowledge of that part of the world is quite limited," he admitted. His manners were mild, his smile friendly. "So what made you do this? Why did you decide to leave the U.S.S.R.?" I paused, figuring out how to respond without sounding false. "There were two basic reasons," I said. "Firstly, the political system in the U.S.S.R. is so oppressive and tyrannical that I . . ."
"Okay," he said, interrupting me. "What’s the second reason?" "I was about to be drafted into the army and would, most likely, have been sent into Afghanistan to fight the Mujahedins. My deferment was aobut to expire in a few months." "Do you have any documents?" "No," I replied. "The person in charge of our group took them away from us." "So you don’t have any ID?" "No." I didn’t like the feeling that was creeping up on me. "But how can you prove your identity?" he wanted to know. "Look, as far as we are concerned, you could be Abdullah from Egypt, or Khasan from Kuwait, or some Jordanian trying to sneak into the U.S. Do you know what I mean?" "Yes," I said, "I understand. But there are very few Jordanians who speak fluent Russian without the slightest accent. And besides, sooner or later Soviet representatives will report to Jordanians that one of the tourists is missing. I am sure they will give the Jordanian authorities the same information that I gave you: my name, my age, my place of birth and so on. I guess you can ask the Jordanians to give you the information about that missing tourist and compare it to what I’ve just told you." "Okay. That makes sense. Do you have any money?" "Yes. I have eight dinars and six U.S. dollars." He smiled wryly. "I’ll be back in a moment." When he returned a few minutes later, he handed me a paper plate with a piece of cake. "Here is a snack for you. When you finish eating, please fill out these forms, sign them and leave them on the table." Mr. Olson came back a short while later with a man in his 60s who had the air of authroity and respectability. "Mr. Badretdinov," said the older man, "my name is James Precter. I am the person in charge of the embassy. Please make sure that you understand everthing that I’m going to tell you now." He looked me squarely and continued. "We asked the Jordanians to accommodate you temporarily until people in Washington decide what to do with you. You have to understand that we are not abandoning you. You will, eventually, be able to come to the U.S. The problem is that our embassy doesn’t have a special department that deals with refugees. In Cairo, for example, it would have been a different story. So we are going to hand you over to the Jordanians for the time being. Sometime in the future, Soviet representatives will want to talk to you. You don’t have to agree to meet with them, but it would be better if you could tell them yourself about the motives of your defection. This way no one will be accused of kidnapping you." "And finally, the most important thing: when you meet with Soviet representatives, don’t tell them that you came to the American embassy. Tell them you went to the Jordanian foreign ministry and asked for political asylum in Jordan. We don’t want the Soviets to know that Jordanians are doing this on behalf of the U.S. In a few hours Jordanian representatives will come here with a car and take you to a hotel." Seeing some doubt in my eyes, he added, "Everything will be all right, I promise. Good luck." The rest of the day I walked around the embassy, talking to the security guard and one of the secretaries. The security guard - 30ish, very cheerful and talkative - enjoyed teasing me. "Is it true," he asked, "that all women in Russia are considered to be collective property?" I responded in the same playful manner. "No, the prettiest ones belong to the state." Once, I pointed to his two-way radio and asked, "Is this what you call a walkie-talky?" "Yes," he replied, "wanna take a look?" He proudly showed it to me, the way a European missionary would show some technological gadget to an aboriginal of a primitive tribe. I asked him who was the wealthiest person in America. He didn’t know, so he asked the secretary. The Hispanic woman rattled off some unfamiliar names. "I think one of them is the richest guy in the U.S.," she said, "but I don’t know for sure." The guard and the secretary seemed to be very fond of each other. Sometimes they ignored me as they flirted. When they spoke to each other I didn’t understand a word, but when they spoke to me I understood them easily. It gave me an opportunity to imporve my English. A few hours later Mr. Olson told the guard to take me to the backyard of the embassy. As we walked out of the back door, I saw a car and a group of people standing near it. In the darkness, the illumination from the headlights made them look like space aliens. We approached the group and I recognized Mr. Precter, head of the embassy. He shook my hand. "These are our Jordanian friends," he said. "They will take care of you from now on. We will contact you later, when everything is settled. Good luck!" Mr. Olson and the guard then shook my hand and wished me luck. The Jordanians were suspiciously silent. They asked me to get into the car and two of them sat on each side of me in the back seat. The gate of the embassy compound opened and the car moved out to the back street. "So where are we going?" I asked nervously. "To Amman," responded one of the Jordanians curtly. The rest of the ride was in silence. I wondered why they didn’t even talk to each other in Arabic. It was strange ... eery. I felt as though something sinister was about to happen. For the first time since the beginning of the whole adventure I was scared. I feared these strangers were taking me directly to the Soviet embassy. My thoughts were interrupted when the car came to a stop. In front of us was a wall eight feet high surrounding a building six stories tall. For a moment I thought my heart would stop. Is this the Soviet embassy? My mind was put at rest when I heard Arabic speech inside the compound. No, this wasn’t the Soviet embassy. This was a hotel. Then I saw a sign on the side of the building: "Hotel Amman". On the picture. 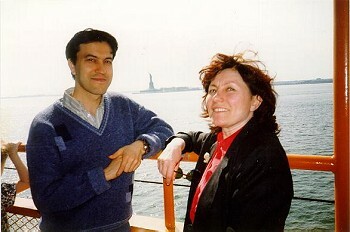 Sabirjan Badretdinov and Riva Rudisser (Sedelkina) are against the background of the Liberty statue. 1996. I got acquainted with Sabirjan in a very peculiar place - in the studio of the Radio Liberty in Munchen. He was working for the Tatar-Bashkir Service then. Riva Sedelkina (Rudisser by her husband) was born and grew up in the village of Bolshaya Polyana (Isa in Tatar) of the Kadoshkino district, Mordovia, studied at the foreign languages department of the Chimkent Training College. She used to work for the Radio LIberty for many years as a radio announcer and an observer. She lives in Austria nowadays, teaches French in one of the schools of Bregenz. Her daughter Alina studies at the Vienna University. Riva’s husband, an Austrish engineer, died a long time ago, three years after he had brought her to Austria from the USSR. He had come to Kazakhstan to set some Austrish mining equipment and met a charming interpretor, Riva Sedelkina. Later they got married. But we shall ask Riva to tell us all about it if she agrees to have an interview with our newspaper.